I was in Spotlight today, and walked back to the fabric section. 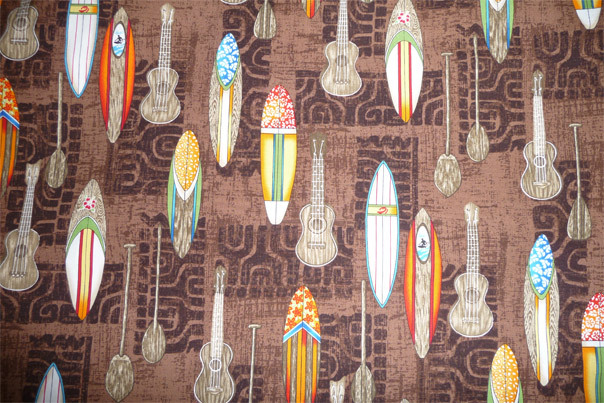 I was looking for something in particular (fabric to make a pair of lightweight summer slacks) - but didn't find what I wanted, so I walked out of the fabric department WITHOUT BUYING ANYTHING. Yup. I know. Incredible. But it's true. My "sister/friend" Janelle married her Prince Charming in August. At the time, I sent arranged for them to have a fabulous wine and goodies basket from Wyandotte Winery (which is owned and operated by friends in Ohio). 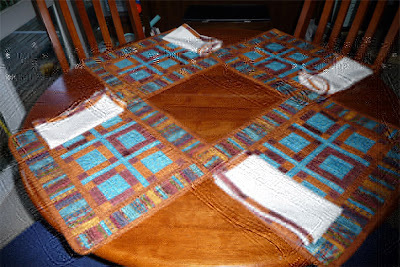 But I wanted to give her something more personal, so I started working on placemat quilts using Egyptian-style prints (Janelle is an ancient Egypt fan). I finally finished the project on December 28. At least I can say that it got done in the same YEAR as they married (insert sheepish, blushing grin here). 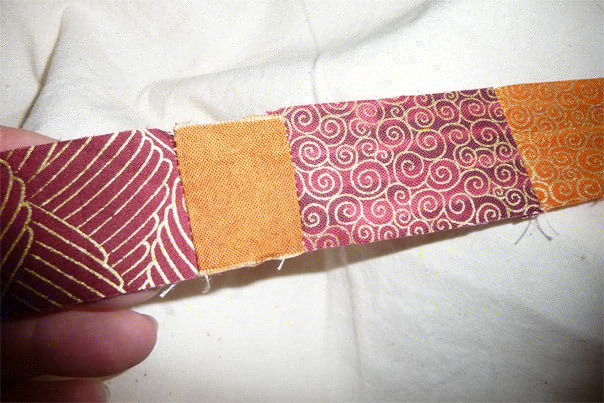 Because of a SNAFU along the way, I ended up with a bazillion little off-cuts of fabric, which I stitched together in a long strip. The Thursday before Christmas (2 days after I'd bought our Christmas turkey), our refrigerator carked it. Great. Very expensive turkey tossed in the rubbish bin and lots of other things joining it in the name of "food safety" practices. We had our Christmas celebration at our house in the city (which has a working fridge), so all was well as long as we were there. Eventually, though, we did have to come home and face the music. We decided to try our luck with the after-Christmas appliance sales. Guess what! We found a good fridge at a reasonable price plus %15 off. I had to celebrate, and as the appliance store is right next to a Spotlight store, well... 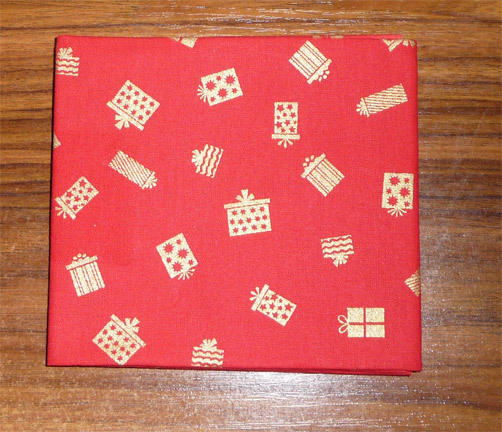 ...I celebrated our good fortune by running in to see what might be left in the way of Christmas fat quarters (still advertised to be still at 50% off, as they had been before). I came away with 4 quarters of this red and gold calico. It will blend in well with the "cockatoo prints" bits I picked up a couple of weeks ago (at a different Spotlight store). I'm glad to have found this, as I realized after pre-washing and looking at what I'd gotten a couple of weeks ago, that I didn't have quite enough dark red to put in with the light cockatoo calico. 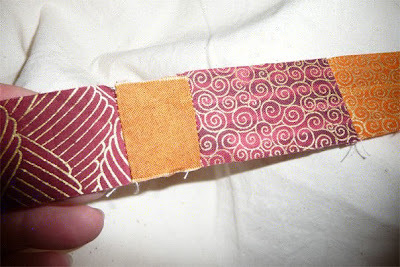 With these 4 fat quarters, I should have more than enough to come out with a decent design. Isn't it adorable? 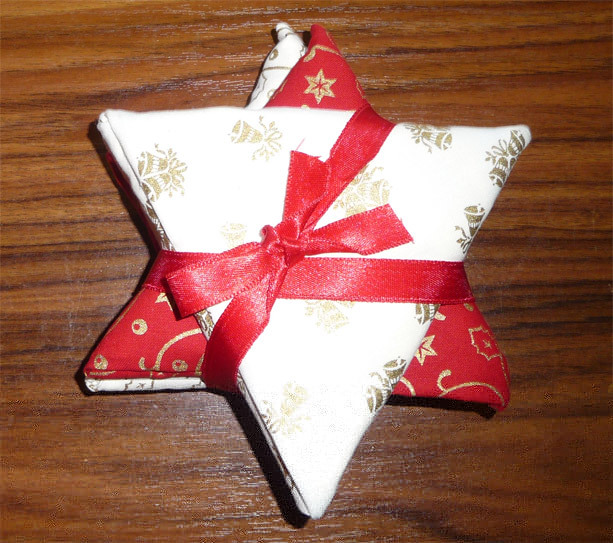 Five fat quarters folded into triangles and then tied together with red ribbon to make a Christmas star. I bought 2 packages of this, so there's plenty to play with. As far as what to use it for, well, quilting guru Pauline pointed out how lovely quilted cushions for the couch could be, and Christmas pillow/cushion covers would be perfect! 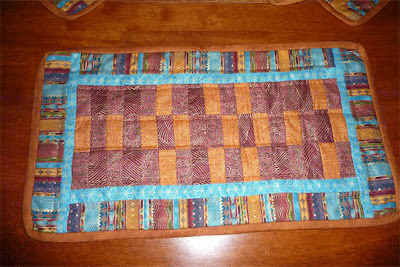 I'm thinking of doing a design that has four blocks per cushion, and do different kinds of blocks. It would be a good way for me to experiment with some block designs that I haven't tried before. Maybe a "Windmill" block pillow, "Dutchman's Puzzle", or "Spools". And there's a block design I recently became aware of and fascinated with: Card Trick. Hmm... lots of possibilities and lots of fabric to play with. And pillow-cover quilts will be relatively quick projects that will give me a sense of accomplishment, plus a break from large bedspread-size quilts.